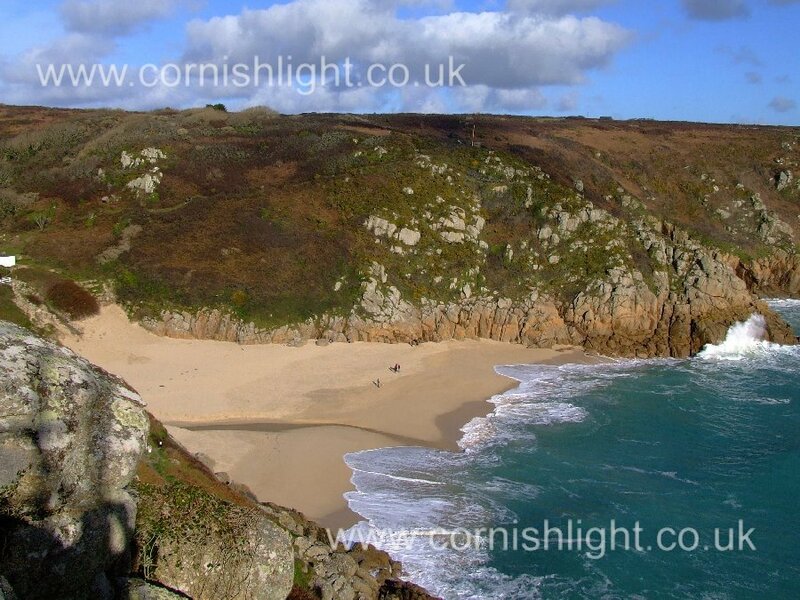 Cornwall why not enjoy a Winter Break? Cornwall Winter Breaks Christmas and New Year. Towns and villages decorated with lights. Looe with boats in the harbour sparkling. 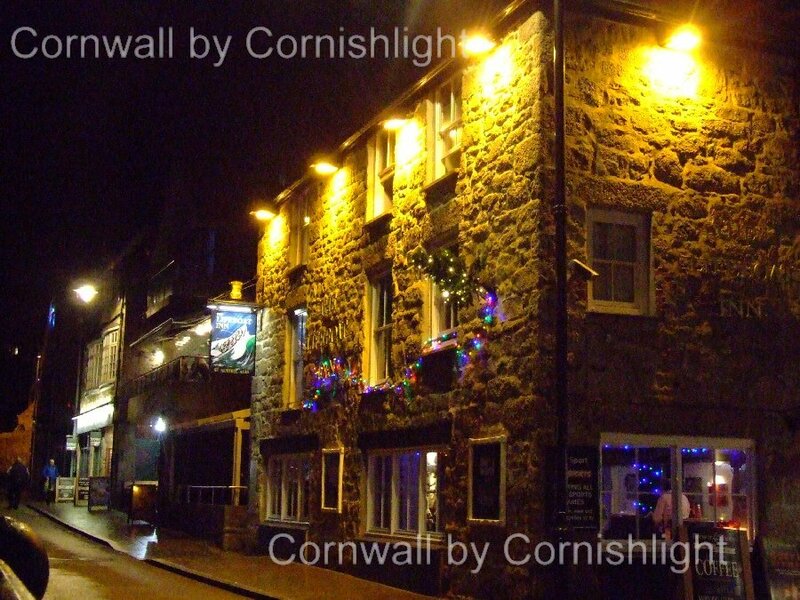 Mousehole with its famous Christmas Illuminations. Cosy cottages with log fires, some with four poster beds. Pubs and inns with low wooden beams. Guesthouses with bed and breakfast overlooking the lights around the harbour. 4 star hotels offering a candlelit Xmas Dinner. Lots of nice places to stay. From a short winter holiday to New Year breaks Churches the true meaning of the Season. Winter in Cornwall tends to be mild, so don't expect a White Christmas- Xmas Day is far more likely to be overcast with southwesterly winds. Deep crisp snowfalls that last more than a few hours are rare-to be made the most of when they occur, by adults as well as children. The silence and stillness of countryside covered in a white carpet. Only the shriek of children on toboggans breaking the silence. The sun low in the sky even at mid day. What is the weather in Janary? Well average daytime temperatures are around 8c, dropping to 4c at night, making for only a small chance of cold weather. Severe frosts in Cornwall are thankfully as rare as heavy snow. By the New Year the first snowdrops will be out, daffodils will be in bud. Rooks, one of the earliest nesting of all birds, will already be paired and rebuilding last years nests high in the branches. Seals will be using their winter haulouts, thought peak numbers do not occur until early spring. Estuaries will be alive with winter migrants such as teal and widgeon. Huge waves often pound the shore, driven in by deep depressions far out in the Atlantic- yes this is really Poldark country. 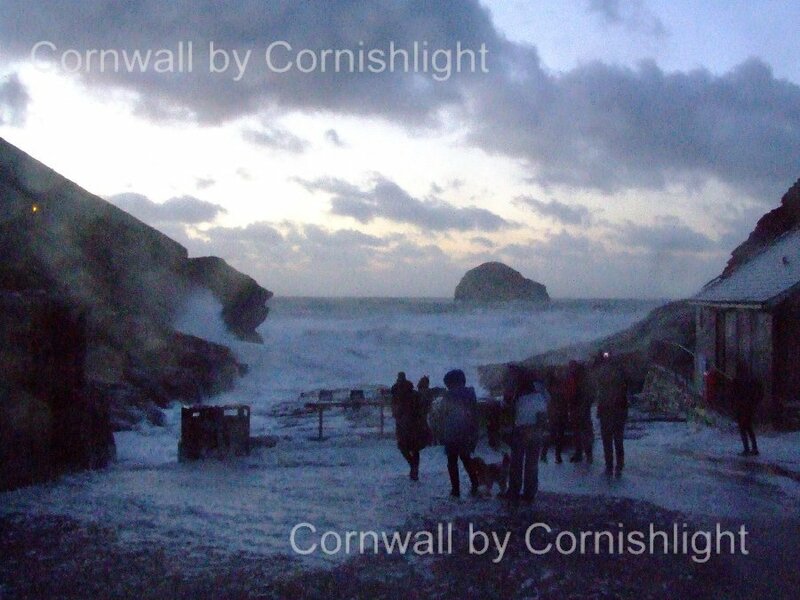 It can be so exhilarating winter storm watching from a very safe distance, so well keep back from cliffs and the sea. Some say the only safe way is to watch from the safety of the inside of a car. Inland the wooded valleys and moors have a bleak beauty not seen by the summer holiday visitor to Cornwall. Well walked Cornish coastpaths may well be deserted except for the occasional walker. When the sun does come out, especially on a clear day, when many of these photographs were taken it is great to be on the coast. Grab those wellies, coat, and scarf- perfect weather for a brisk stroll along a beach, deserted apart from a few other hardy souls. Dog lovers will be delighted that many of the summer dog bans are lifted, giving even more wide expenses of sand for fido to chase imaginary gulls. By the end of February crocus and the earliest of daffodils a blaze of welcome colour, primroses following close behind. Young rooks will have fledged, now squawking noisily on the thinnest branches testing their wings. 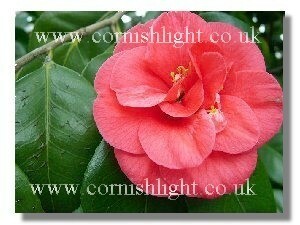 Camellias are providing a burst of colour in many Cornish gardens. Many hotels have mid winter offers, making this a good time for a break away from the crowds of summer. When the east winds blow birds such as redwings, lapwings and fieldfares are pushed into South Western Britain - to what they hope is a warmer climate. Estuaries, such as Hayle, the most southerly of all Britain's estuaries provide a winter home for thousands of wading birds, from curlew, to widgeon to teal. Grey seals are common all around the coast of Cornwall, it is not unknown to see them close up in St Ives or Newquay Harbours. More usually one will see them bottling (bobbing nose up) in one of the many hidden coves around the coast. They give birth in late September or early November, spending the winter at inaccessible haulouts beneath sheer cliffs. If you are very very lucky you may peer down through binoculars and see a newborn pup being suckled by its so protective mother. 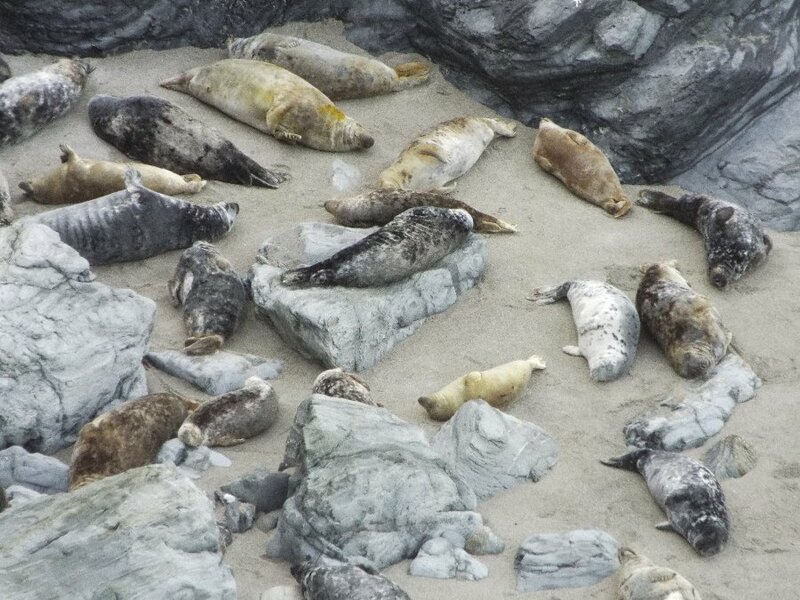 It is not unknown for over a hundred seals to be seen at one such haulout in the west of the county, where the above photograph was taken one mild January day on a receding tide. Number peak towards the end of March, - most will spend the summer on rocks and skerries off shore where they are less likely to be disturbed. By March tree buds breaking out, a clear sign that spring is on its way. All over Cornwall fields of daffodils will be full bloom, providing a welcome blaze of colour. The days will be pulling out and it will be good light until well after 6pm. Spring is just around the corner.